Arachnomorpha - Wikipedia, entziklopedia askea. Arachnomorpha artropodoen barnean dagoen klado bat da. Hona hemen 2003an Bergström eta Houk proposaturiko kladograma. ↑ Trevor J. Cotton & Simon J. Braddy (2003) «The phylogeny of arachnomorph arthropods and the origin of the Chelicerata» Transactions of the Royal Society of Edinburgh: Earth Sciences 94 (3): 169–193 doi:10.1017/S0263593300000596 . ↑ Jonathan R. Hendricks & Bruce S. Lieberman (2008) «New phylogenetic insights into the Cambrian radiation of arachnomorph arthropods» Journal of Paleontology 82 (3): 585–594 doi:10.1666/07-017.1 . 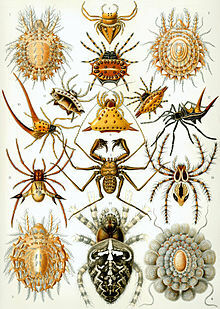 ↑ Bergström, J., & Hou, X. G. (2003) «Arthropod origins» Bulletin of Geosciences 78 (4): 323-334 . Orriaren azken aldaketa: 30 urtarrila 2019, 16:45.